The moat around the old city wall. 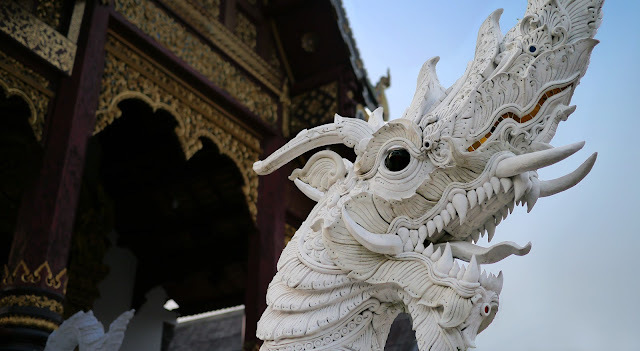 A protector outside a wat. A spirit house, found outside of most homes or businesses. Providing a dwelling for spirits away from people. 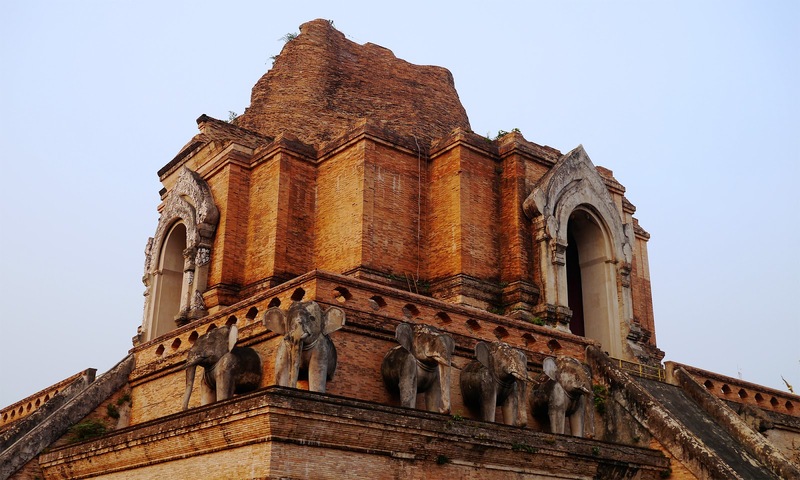 Wat Jedi Luang, it's spire destroyed by an earthquake. The Sunday night walking street market. Shopping for ingredients at the fresh market. Chilies, an essential ingredient for Thai cooking. Bree at our cooking class. It turned out that my uncle Jim has a house in Chiang Mai and was nice enough to let us stay there. We took a pretty painless bus ride up to Chiang Mai from Mae Sot (via Tak). Once in Chiang Mai, we met up with Ning, who is my cousin-in-law once removed(?-Jim's wife's niece). She took us for a tour around the city and for some late night pad thai. Chiang Mai is the largest city in Northern Thailand but it doesn't have any of that crazy chaotic feel of Bangkok. 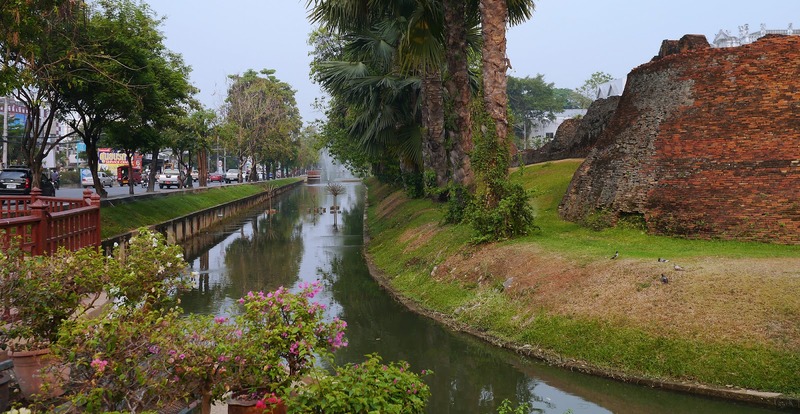 The central area is part of the old walled city which was once the capital of the Lanna Kingdom. Almost everywhere we went there was a Wat (Buddhist temple). There are over 200 Wats in Chiang Mai and some of them are dated as far back as the 1300's. We did a lot of walking around and some scootering around, including a visit to the Sunday walking street which is a night market that spans the width of the old city. A big highlight was the cooking class at Morning Glory Restaurant & Cooking School that Ning help arrange for us. We learned all our favorites: curry pastes, green and massaman curries, pad thai, veg. w/ cashew nut, tom yum and tom kha soup, green papaya salad, spring rolls, peanut sauce, mango w/ sticky rice, pumpkin hummus and soup. All of this within four hours! We ate along the way and took home enough food for a big dinner later that night. Special thanks to my uncle Jim for letting us stay at his place and to Ning for being a great host. It was nice to stay in a real house again. We got to do laundry, sleep in a bit, cook our own breakfast, and pretend that we lived in Thailand for a few days.